Ever try peanut butter on your hamburger? It isn’t helping that I’m starving as I write this… So I was listening to a few minutes of NPR’s show about food. It’s called The Splendid Table. Also check out www.hamburgeramerica.com (scroll down the page to see the other hamburgers). The site is ugly but the hamburgers look great! 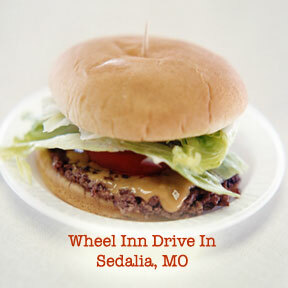 Have you ever tried a hamburger with melted peanut butter? It sounds bad at first, but now I’m interested to try it. Perhaps without ketchup. Would you try it? There a place here in Tallahasse, FL called Monks. They serve a burger called the lip smacker which has peanut butter, bacon and cheddar cheese and wow is it good. I was reluctant at first but after trying it ill only eat my burgers with peanut butter on them. This is so funny. I’ve had the one at both the Corvette Diner in SD and the one in Colorado – think it was at a place called CB & Potts. Both were outstanding. Several people have mentioned how it adds another layer of texture and that’s exactly it – it’s not like a pb sandwich. It really tastes great. YUM!!! I’ve been eating them for years at Brians’ (owned by two guys named Brian) in San Diego – they call it the Frankie Burger. I think I invented peanut butter burgers. I never met anyone until after the year 2000 who had ever eaten one or thought about eating one. I never took a sandwich to school except peanut butter, and I don’t use any condiments (they don’t smell good to me) so as a very young boy I began using peanut butter as a condiment for my cheeseburgers. Probably about 1952 was the first time I tried this and I have been doing it ever since. I never saw this in a restaurant until about 2005 when I was visiting Kansas City and a very nice restaurant my son knew about had peanut butter burgers. Unfortunately when I visted there in 2008 the restaurant (I think it was part of a small chain) was gone. Peanut butter, cheeses, good hamburger and various quality buns or breads make for a memorable feast. Since I am a “plain” food person and can’t get peanut butter most of the time, I order my cheeseburgers plain, or with just lettuce if they have it. At fast food restaurants ordering “plain” often gets you a hot and fresher burger. Sometimes I keep little packets of peanut butter in my car to liven up the burgers. Most people say “gross” when they hear about it. I ask them if they like melted peanut butter on their favorite toasted bread. Most say yes, and then I say — just had a burger and cheese and, Viola! Oh my god!, it was sooo good, it was by accident that my friend dropped her PB on bread on her hamburger, and they are all poosies so she picked it up, and looked at me accross the table and said “here i dare you to eat this” so i did. It was strang, not the taste that was good, but the bite i took, it was in the shape of a triangle, a perfect triangle no doubt! My friend thought it discusting even when we had school hamburgers at school today (which are DESCUSTING) i asked them to bring me one with peanut butter on it, but sadly no one did, or even try it. It was really good! I have tried it and it is amazing. There is a place in London On. Canada that sells peanut butter on hamburgers and they are amazing. I even tried it with ketchup and mustard and it was still very tasty. I like fried pb banana sammys! I have heard of the place in Minneapolis that serves peanut butter on their burgers, and everyone I know who has tried it love it. Personally I would love to try it but I hear at home is different than the ones in a resteraunt, but am willing to try it at home when I can fire up my grill. Come on people, try something different, how do you think all the other foods we eat were invented? it was all people trying this and trying that, we wouldn’t have the PIZZA if someone had not thought of putting tomato on it, as it used to be just crust and cheest and any condiment, so get daring and try one, and when I do, I will be back to let you know how it tasted. MMMMMM I’m eating a peanut butter hamburger right now, woke up this morning craving one. It’s so good! Just trying it now, a burger with mayoketchup, cheese, and peanut butter. Tastes great!! C’mon people get outside your comfort zones! My dad used to make these when I was a kid and OF COURSE they tasted good. It’s fatty and sugary, what th heck, that’s a winning combo anywhere you look. I just had one with mayo, pb, a little lettuce, some regular store bought wheat bread(toasted), and a big ol’ honkin’ beef patty about three and a half inches thick! Wanna bet I’m not smiling and satisfied as I type this? Hahaha…don’t knock it until you’ve tried it. Many things *sound* strange but are actually quite delicious. Ever tried deep fried pickles with ketchup? Blackberry and chipotle salsa on plain vanilla ice-cream? Those are super good too! I had my first PB Burger in San Fransisco in the mid 1990s Hungry Hippo and a place in San Jose – Just burger and PB – I never use mayo on any burger, hate tomatoes and don’t like warm lettuce. I never have tried bacon but I think I will, I sometimes add raw onion if using creamy PB. At least two places in New Orleans have them, Tavern on Citrus [Harahan really] and Yo Mama in the Quarter. I prefer chunky but most restaurants have smooth. Cheeburger offers peanut butter as a topping so it must not be that uncommon. Ive eaten burgers with cheddar cheese, bleu cheese, worcestershire sauce and peanut butter. I have been eating peanut butter burgers since the 60’s. The peanut butter melting into a juicy burger is an unbelievably delicious combination. It’s actually delicious. I used to have it all the time when I was younger. Had a couple of those before that place closed. Pretty good and I really don’t care for peanut butter.